Hope's Cafe: Violight UV Toothbrush Sanitizer-Review and Giveaway!! 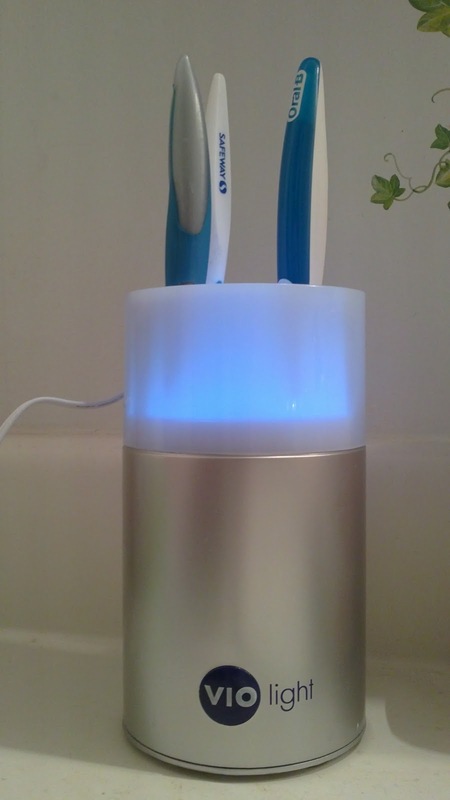 Violight UV Toothbrush Sanitizer-Review and Giveaway!! Do you ever wonder about all the germs that must get in your toothbrush bristles? I mean, seriously...we usually don't put a cap over the toothbrush unless we're traveling...it sits on the counter all day...and then we put it in our mouth to "clean" our teeth! I have thought about it before, and was excited when given the opportunity to review the Violight Countertop Toothbrush Sanitizer! 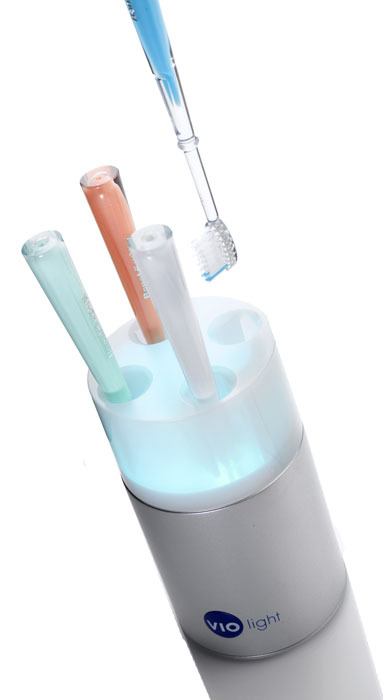 This sanitizer has a unique way of keeping your toothbrush sanitary-it uses UV light! Blue light means it's on! "By using Germicidal Ultraviolet Light, which physically destroys the DNA of microorganisms, our award-winning Violight Countertop Toothbrush Sanitizer and Storage System will sanitize up to four toothbrushes at one time. Violight prevents cross contamination of bacteria from one toothbrush to another, and even accommodates electric toothbrush heads. Its translucent cap lets you know it's working, and it includes a removable drip cup for easy cleaning. With a one-touch start button, auto shut-off, and safety cap that de-activates the light if it's unlocked or removed, this Sanitizer is a must-have for those who are health-conscious." I set this on the bathroom counter, and have started keeping our toothbrushes in it. I really like that the cup holding the brushes can be easily removed and cleaned, to ensure that the toothbrushes stay clean. And I personally think the UV light is an ingenious way to sanitize the brushes. I can't say enough how much I like the Vio100! It is so nice to know I don't have to worry about dust, germs, or anything else getting on my toothbrush! Simply plug in the sanitizer, push the button-and 10 minutes later you have a safely sanitized toothbrush! Violight is giving the Vio100 Countertop Toothbrush Sanitizer to one of my readers!! Go to Violight and tell me another product you like! 1 entry-Sign up for the Violight newsletter (top of homepage). This giveaway ends Monday, January 10, 2011, at 11:59 p.m. Please leave a valid email address in each comment, as this is how the winner will be notified. Winner will have 48 hours to respond, or another winner will be chosen. Giveaway open to US residents only. Disclaimer:I was not monetarily compensated in any way for this post. All thoughts and opinions are mine. All quotes taken from the Violight website. I would like to try the Violight UV Wand, its always hard to sanitize computers and remotes. I like the Violight personal/travel toothbrush sanitizer. Violight Travel Toothbrush Sanitizer . I like the Zapi:) Please enter me. Thanks! Entered the Vitamin Water giveaway. Entered Redken giveaway as well. I would like to try the Violight Countertop Toothbrush Sanitizer. Very cool! I would like to try iZap travel sanitizer. I like the Zapi Doodle in Pink. That is so neat! My daughter would love the ZapiPOP. I would love to win.